A friend of mine just posted this photo of an actual sign taped to a light pole in his neighborhood. 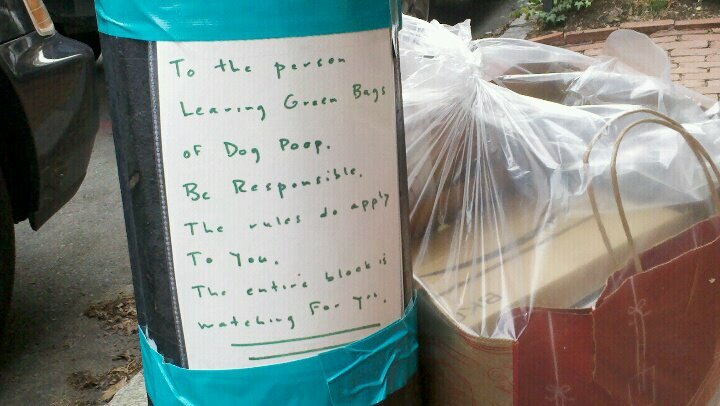 How deliciously passive aggressive. Must include this in my next Angry Smile training! Don’t let the title of my recent post in Psychology Today fool you; little kids are not the only ones who employ psychological defenses to guard against emotional pain. Tweens, teens, and adults alike often go to great lengths to mask inner pain with defensive words and behaviors. Parents, teachers, caregivers and friends who recognize common, defensive verbal façades are in the best position to support a child’s true feelings. Please check out my recent post on PsychologyToday.com to learn how to recognize four of the most common defenses used by kids. You get the letter from school in the mail. A teacher has identified your child as potentially “gifted” and wants to send him or her for further testing and evaluation. Flash forward: the tests are completed, your child is a whiz, and enrichment classes will become a part of his regular school routine. What wonderful news! It was in my family. Until all of a sudden, it wasn’t anymore. Instead of my seven-year old feeling enhanced self-confidence and pride in her intellectual and creative abilities, what I began to see was a newly anxious little girl who cried over imperfect scores on her handwriting test and wanted to give up books “forever” when she found out she placed second in her class’ monthly reading contest. Does any of this sound familiar to you? Please check out my post on PsychologyToday.com for 7 essential strategies on how professionals, parents, and caregivers can nurture a “growth mindset” in their gifted child. When it comes to the damage that bullying can do to a young person’s self-esteem (not to mention desire to go to school, academic success, relationships at home, etc), this old adage has been proven untrue a million times over. The article posted below talks about the importance of changing mindsets when it comes to the real and lasting damage that bullying can do. It also emphasizes the role of technology in bullying and how important it is that parents are aware of how their kids are using technology to impact others. How do you approach passive aggressive behavior with your kids?